A high-line PRS electric solidbody with arguably the best-sounding and functioning piezo system currently available. Almost faultless. Perhaps the best solution we've seen for those who want acoustic and electric sounds in one guitar. Only bird inlays offered. 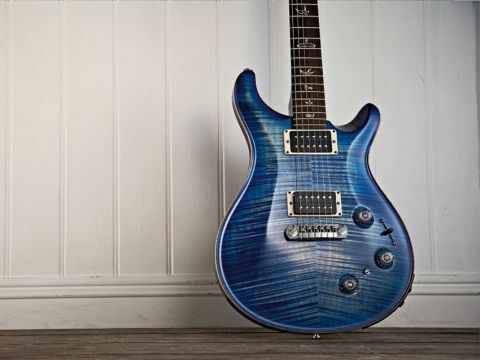 We'd like to see the P22 piezo system offered on other PRS solidbodies. The P22 may be the first PRS solidbody electric that comes with a piezo system to produce acoustic-like sounds when amplified, but this system, and its development, date back over a decade. In fact, its been either an option or a standard feature on PRS's double- and single-cut Hollowbody guitars since the early-2000s. But by making the P22's new piezo electronics smaller, PRS has been able to fit it into a slightly extended cavity of a PRS solidbody. At full retail it adds £500 to the price of a PRS Custom - less at street prices - while the P22 is around £500 less expensive than the other piezo-equipped PRS guitars, the single- and double-cut Hollowbody II. "If you peer into the cavity you'll see six trim pots that let you balance the piezo output of each string." Aside from having a smaller electronic footprint than the Hollowbody's piezo system, the controls have been moved around a bit. The P22's layout has the volume close to the treble stud of the piezo-loaded adjustable Stoptail, just like a Custom. In the same position as the Custom's tone control is the piezo blend control and between that and the five-way lever selector for the magnetic pickups is the magnetic's tone control. Between these two lower rotary controls is the 'system' mini toggle switch that voices either piezo or magnetic modes, or both. The controls are more cramped on the Hollowbody - not least that mini toggle, which can easily be knocked while making swift volume control adjustments. On the treble-side edge guitar of the lower bout we get a long panel holding the mixed mono output (labelled 'mix/mag'), the piezo output and the battery housing necessary to power the piezo system. With a standard mono jack in the mix/mag output, the volume control works as a master for both the magnetic and piezo outputs; the blend control - which only functions with the system switch in its middle position (both systems on) - moves between magnetic (fully 'off' anti-clockwise) and piezo (fully 'on' clockwise). "Plugging another mono lead into the piezo output means you can now send each signal to separate amps." Plugging another mono lead into the piezo output means you can now send each signal to separate amps and the controls' functions are slightly altered in that the blend now becomes just a volume for the piezo system and the 'master' volume of the mix/mag-only output becomes just a volume for the magnetic pickups - as with a regular PRS guitar. There is no onboard tone control for the piezo system but when removing the battery, if you peer into the cavity you'll see six trim pots that let you balance the piezo output of each string. You might want to leave that to a qualified technician and unless you're changing string gauge - perhaps using a wound instead of a plain third string - the string balance sounded perfect to us. If you haven't played a Custom 24 since its 2011 upgrade, its new five-way lever magnetic pickup selector switch voices the 53/10 humbuckers in the following fashion: position one, bridge humbucker; position two, bridge humbucker with inside single-coil of neck; position three, both humbuckers; position four, inside slug coils of both humbuckers; position five, neck humbucker. We've tested the 53/10 humbuckers before, but here they sport an uncovered design that shows off PRS's own- design bobbins, which are less like standard 'bucker bobbins in that the tops are curved and more square-edged. Aside from the onboard electronics, the P22 uses a 22-fret platform with a thinner McCarty-thickness body depth of 53mm, slightly thicker than the Custom. The faded finish almost looks aged in the way the plain maple pokes through the blue stain. Of course, it's covered with the new thin nitro/acrylic hybrid V12 finish and as we've noticed before it does seem to mark very easily. Neck profile is the "pattern regular" - "similar to the traditional PRS regular neck found on guitars made in the late eighties at PRS's former Virginia Avenue location," says PRS. Spec-wise it's the narrowest neck, at the nut, that PRS offers - but only by 0.8mm - and has the same depth at the first fret (21.4mm; 23mm at the 12th) as a pattern profile - previously known as a wide fat. Whatever, it's a great feel. There's enough depth to feel meaty but it's not a huge handful. Typically we have an unbound rosewood fingerboard with a 254mm (10-inch) radius, perfectly installed 2011 bird inlays with their off-white outlines and subtly metallic bronze- coloured in-fills. Fretting is medium jumbo gauge with good height, all nicely finished and, as usual, intonation and tuning stability is excellent. While the standard PRS Stoptail bridge has preset intonation, the adjustable Stoptail here can be intonated for any string gauge. Equally efficient are the open-backed Phase III tuners with their large aluminium buttons and top locks on unplated brass-coloured posts. Plugged in, does the P22's piezo sound like a nicely mic'd Martin dreadnought? Well, no. But does the piezo undersaddle on your Martin dreadnought sound like a nicely mic'd Martin dreadnought? No. But does the P22 sound like an amplified electro-acoustic? Yes. Except of course it has the playability, sustain envelope and more fluid characteristic of, well, a PRS solidbody electric guitar. Oh, and you don't have any feedback issues. Lovely. Would we want to play an acoustic set with the P22? Well, you could, but it's a different sound with a different character. There's a beautiful modern zing and presence to the piezo sound without the often metallic resonance of some other metal-bridge piezo systems we've heard plus, of course, string gauge plays a big part in what we're hearing. See how your Martin sounds strung up with 0.010-gauge electric strings and you'll hear just how good the P22 actually is. Leaving the piezo side for a moment, let's not forget just how good the magnetic sounds are too. We're written before about the very old character of the 53/10 humbuckers and again that's what we hear. There's a nice bark and attack from the bridge pickup that almost sounds like your tone control is backed off a little; the neck pickup remains one of this writer's favourite tones with an ability, using just the volume control, to go from evocative jazz voicings to Kossoff-esque leads. "To our ears its just such a musical tone, centred perhaps in classic rock"
To our ears its just such a musical tone, centred perhaps in classic rock but it handles much heavier-gained sounds and much cleaner voices too. The mixed sounds add more single-coil tonality the two inner slugs (position four) the most Fender-like while position two (bridge humbucker and neck single-coil) adds a tad more thickness. However, especially when combined with the piezo output, we did miss some straight bridge or neck- only single-coil sounds. Any hybrid guitar takes some getting used to in terms of its controls - especially here, as the functions subtly differ depending on whether you're using the mixed mono output or the separate system outputs. The latter, of course, is where the fun really starts. Running the piezo through our acoustic pedalboard into an AER and the magnetic output through our standard pedalboard into our electric amp, there's a lot to take in. But even just adding a little piezo to the neck pickup for some jazzy sounds, the width, like a stereo spread, is vast. You can add some modulation and delay to the piezo side but keep the magnetic side effects-free - where's the nearest stadium stage? It sounds huge, especially as the ultra-fast attack of the piezo almost comes before the magnetic output, like an automatic double-tracked simulation. "Full marks for not just plonking an off-the-shelf piezo bridge onto a Custom or McCarty"
PRS likes to do things in its own way, from the design and construction of the guitars through to their own pickups, hardware, control knobs, even pickup rings and bobbin shapes. So full marks for not just plonking an off-the-shelf piezo bridge onto a Custom or McCarty. Having used the PRS/Baggs piezo system extensively on a Hollowbody, it's long been our reference hybrid system; on this P22 platform, if anything it sounds better - and certainly the less cramped controls make it easier to use. Trying to replicate a good plugged-in electro-acoustic and a good magnetic solidbody tone on one guitar is a flawed dream. The feel of those two dramatically different guitars, not to mention string gauges and sounds, means combining them makes for a jack-of-all- trades, master of none. Yet if you want to add some acoustic textures to your sound the P22 is one of the most elegant solutions available. It's posh- looking and costs a substantial amount, but it's very hard to find fault with.